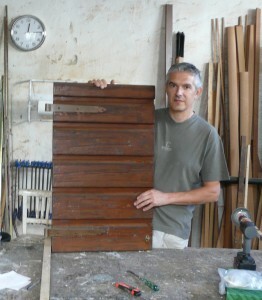 Sergio Cellai has a workshop that borders on a stream that used to run the village mill at Mercatale Valdarno. He learned his trade from his father, and specializes in making traditional Tuscan windows, doors, and shutters in a time-honored fashion. This is an important craft for an area of the country where old farmhouses and historic villas must be restored with old-style fixtures which nonetheless need to incorporate energy-saving thermal glass and various types of insulation. Recently Sergio made shutters for the Villa I Tatti Limonaia in Florence, not only re-using the original ironwork, but choosing seasoned chestnut wood, which will better resist rain and sun, and perfectly matching the original color of the paint. 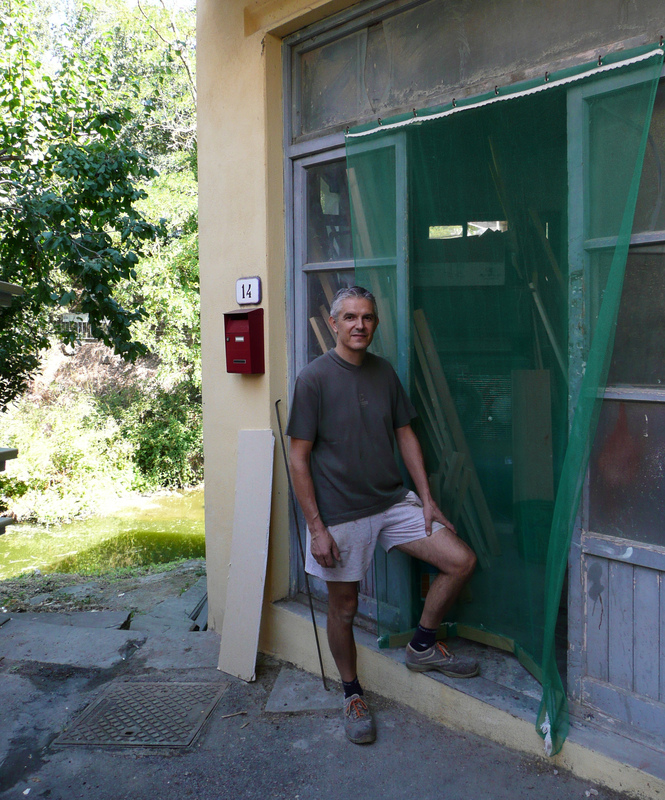 For years he has been coming to the rescue of Il Poggiolo, maintaining woodwork, creating traditional style doors for the Fienile, and recently he even made a decorative (and sturdy) child-gate for the top of the Casa Colonica stairs. 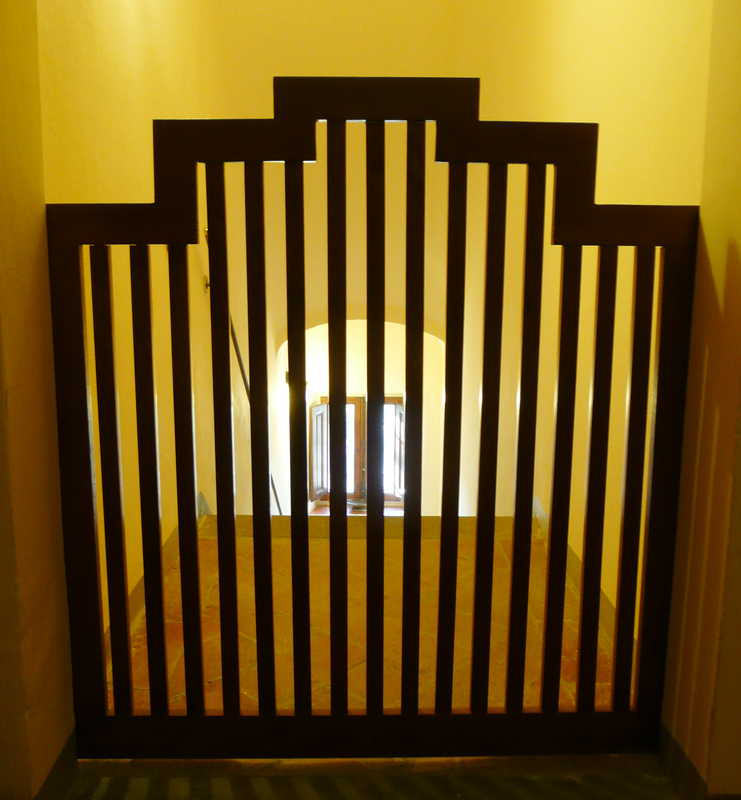 We had been thinking about this child-gate for years, not wanting to settle for an ugly barred rectangle at the top of a beautiful arched stairway. Finally Sergio and I had a brainstorm, and came up with the gate you see here. 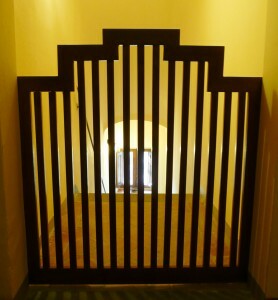 He had oak slats of just the right width, and the stepped top to the gate was calculated to compliment the curve of the arch. It now looks as if it has always been in place.